It is scaring me just looking at it. and I am not talking "circumference"!!! 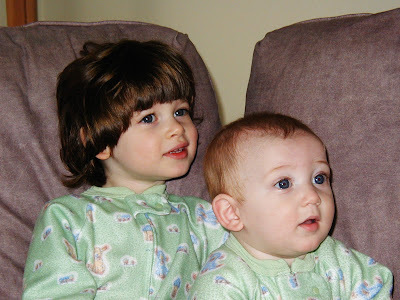 2008 marked the last year of matching jammies. Adorable. I feel like I didn't really get to know Connor and Hannah during these years (being 3,000 miles away). I love any and all photos of the precious time that I missed! This is from when you did know them - we'd only been here a month. They grow up fast, don't they. Also, regarding the big head thing, it seems like our 12 week old has a bigger head than our 2 year old. It's a little weird. Soooo, I am laughing out loud right now. Maybe it's the angle of the shot that makes his head look bigger. At least that's what I like to say to myself when I see my little ones HUGE ears! Too funny. Love this picture! I thought it was hard to believe how little they were in the one I posted today, but this one is nuts! lmao. that' it. just laughing. you are so cute. I meant your early Vegas years. You should post Hannah's pic with the huge can of green beans next! look at that pic... how CAute!